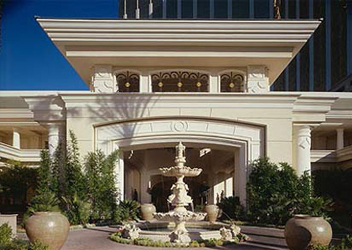 The location of the Four Seasons Hotel is along South Las Vegas Boulevard . This is a location that is also known as the Las Vegas Strip and the Four Seasons is therefore located right in the heart of the action in the city of Las Vegas . It is located next to the best gambling venues, the best entertainment venues and is also close to all of the non-casino tourist attractions that you might want to visit in the city. No matter how you slice it, the Four Seasons Hotel is located on a land plot that would be considered prime real estate in Las Vegas . The Four Seasons Hotel has followed the example of some of the best hotels in Las Vegas in the sense that it has provided many different choices to the people that choose to stay there for their Las Vegas getaway. For example, there are six different guest room formats for you to choose from at the Four Seasons as well as six different guest suite formats. The guest room formats can be as basic as a normal guest room or they can be as involved as the executive suite that is one step below the more luxurious guest suite category. You can stay in a normal one-bedroom guest suite at the Four Seasons or if you really want to go for the gold you can stay in their world famous Presidential Suite with all of the trimmings attached. The Four Seasons Hotel is one of the few resorts along the Las Vegas Strip that does not contain a casino. However, its location makes up for that partially. The Four Seasons Hotel does have a spa/salon package that you can utilize as well as some excellent dining venues for you to use. There are many entertainment activities available in the hotel as well as well as many excellent rooms that can be used for big parties at rates that are discounted if you book an overnight package as well. In spite of the lack of a casino, the Four Seasons Hotel still has a lot to offer. The Four Seasons Hotel is one of the pure accommodation specialist resorts in Las Vegas and for that reason it definitely has a leg up on the competition insofar as the overnight stay is concerned.